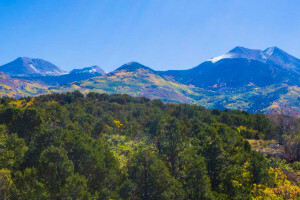 The Monitor and Merrimac Trail itself offers views of the towering peaks. An easy trail in regards to elevation gain and length, the Monitor and Merrimac bike trail also encompasses a lot of sand dune riding (or hiking). 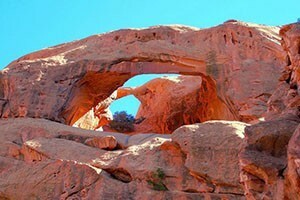 It does offer, however, much desired slickrock riding and beautifully colored sandstone. Because it is a ways north of town, the trail is peaceful and secluded. Drive north out of Moab, Utah on US 191 for about 15 miles. Turn left onto a dirt road just passed mile marker 141. The "No Trespassing" sign refers to the railroad tracks that you will immediately cross. Park under the huge cottonwood tree. Ride toward the Mill Canyon sign. Veer left at the spur toward Tusher Canyon. At the next spur marked Mill Canyon, veer left and then follow the main trail toward Joe Camel Butte. This is a lollipop trail and will end up at your car again.